Jeff Frost, new owner of The Urban Pear in the Glebe says he wants his weekend brunch to be known as the best in the city. Based on my Lobster Benny this morning, this goal is a distinct possibility. Brunch at the Pear is targeted to a niche market that wants a high end experience, where you may come to celebrate, expect quality food and to spend time visiting your company. It's not a quickie diner or a place to mop up your innards from your night before escapades. Neither is it uptight and stiff. Just civilized and cozy. It's also one of the few places that offers brunch both Saturdays and Sundays. Although the place is almost all windows, new art of bright colours adorn the freshly painted limonade walls. Sunny on in the inside as well as out. 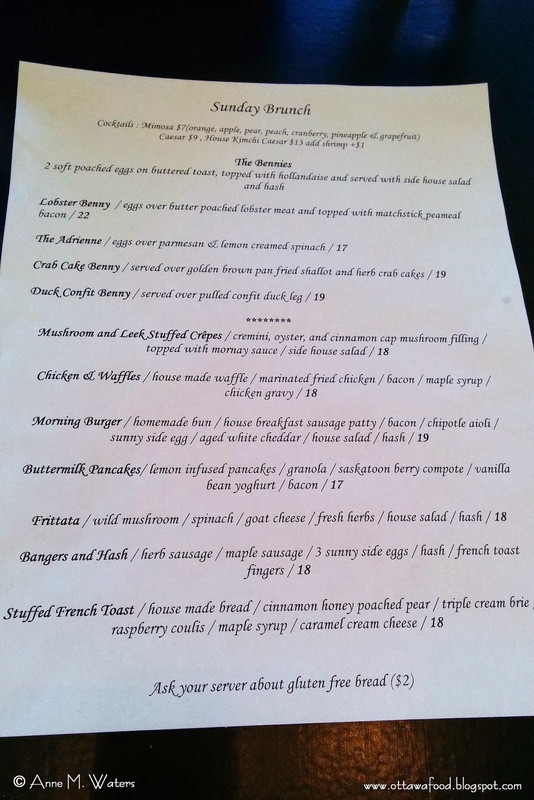 The brunch menu offers ample choices for a small eatery. Their broad social media presence gives many hints to these dishes. Premium pricing meant that their pictures so far though hadn't lured me in. Our visit this morning was impulsive. Shattered plans and the DST clock ticking, my gal pal and I took to Twitter for the save. No picture to distract me or the meaty price tag, I fell in love with the idea of mushrooms and leek stuffed crêpes. Sunday brunch starts at 10! Come in and try our mushroom and leek stuffed crepes. They're new! Well, so did she. Bowing to her choice, I graciously executed Plan B. 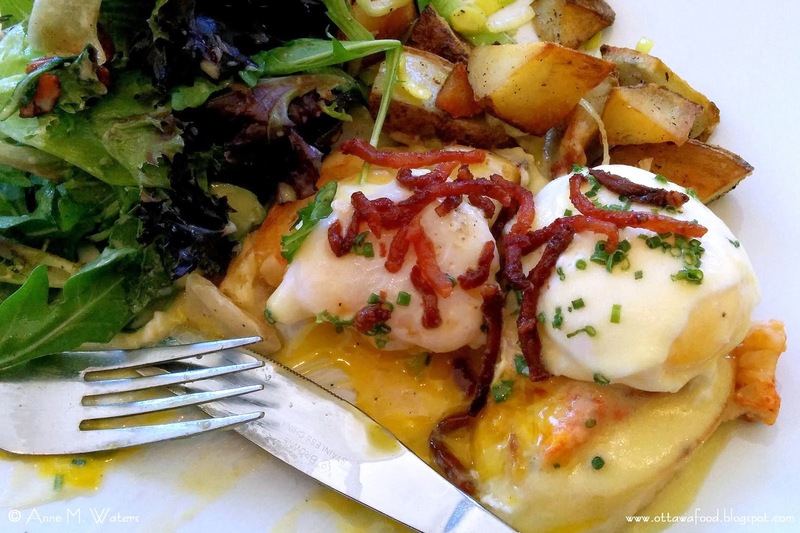 As the most expensive item on the menu, the $22 Lobster Benny seduced - 'eggs over butter poached lobster meat and topped with matchstick peameal bacon'. In fact, all Bennies are promised as '2 soft poached eggs on buttered toast, topped with hollandaise and served with side house salad and hash'. The eggs were just the way I like them. Exceptionally soft and jiggly. The whites just set. The lobster pieces were chunky and supple. All bathed in a hollandaise with pronounced zip, keeping it light and hiding the true richness. I welcomed the large mixed green salad and was relieved that they knew to downplay the dressing. It's about that Benny, after all. The potatoes weren't quite hash by my estimation. Worthy roasted chunks of soft creamy potatoes, there has to be a way more classy name than 'hash'. The crispy matchstick peameal bacon nicely salted the proteins. Suspecting I may have made the better choice, I nabbed a taste of my girlfriend's crêpes. With the bonus of being a vegetarian option, the medley of mushroom filling was earthy, decadent and well sauced in its mornay. Also a solid pick. Our portions were ample. 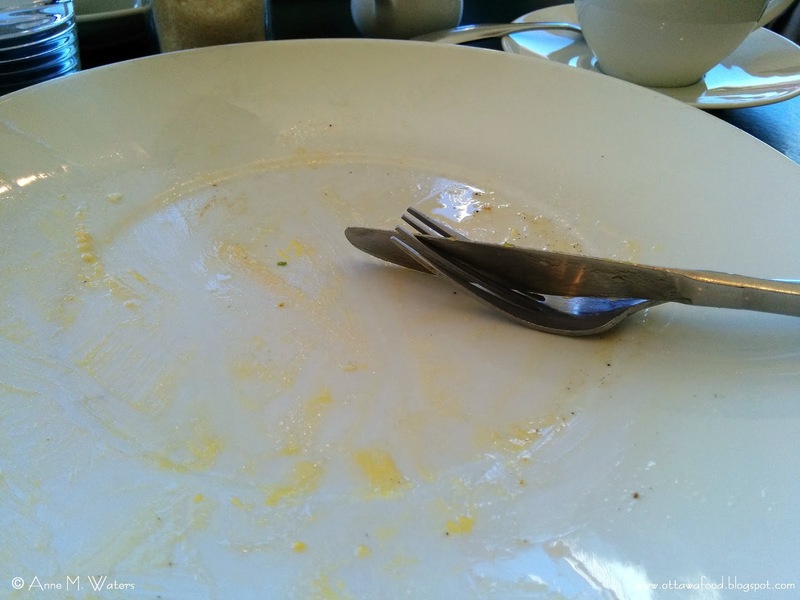 Plate after plate of their stuffed french toast paraded through the dining room. Perhaps the most popular dish of the day. The service was friendly and attentive despite the demands of a very full house. Our meals were well timed. As I often do in restaurants, I skipped the espresso drink and opted for brew. It's a bottomless cup, but pricey too at $3.50. No locally roasted bean here. I'm told it hails from stock at Morala. There are some that will find the pricing distracting. As is often the case, when I have thoroughly enjoyed a dish to its fullest, the time spent on the value proposition tends to fade, rationalizing that there are times to shower oneself with a treat. Plain coffee aside, I have high praise for the Lobster Benny served today. Apologies for scraping the porcelain from my plate. As Jeff chases down the crown for Best Brunch in Ottawa, he will only ever know if you vote with your feet. Thank you for the review, must go and see. I hate the Pedestrian Brunch served in most places in Ottawa. Urban Pear seem to have a good thing. The Urban Pear is definitely pitching 'up-scale'. I would love to hear what you think of the value of the experience when you go. Enjoy! You know what's kind of crazy? 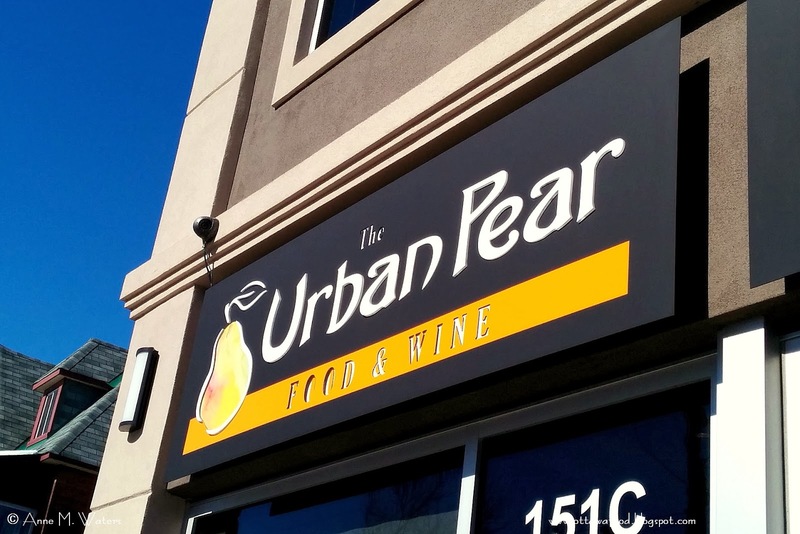 I worked at Feleena's, just next door, for four years... and never once tried The Urban Pear! I need to go. Especially for lobster eggs benny... YUM! Hi Julia! Thanks for stopping into the blog for a read. I'd love to hear if you make it for a visit to The Urban Pear and what you think of the food and ambiance. 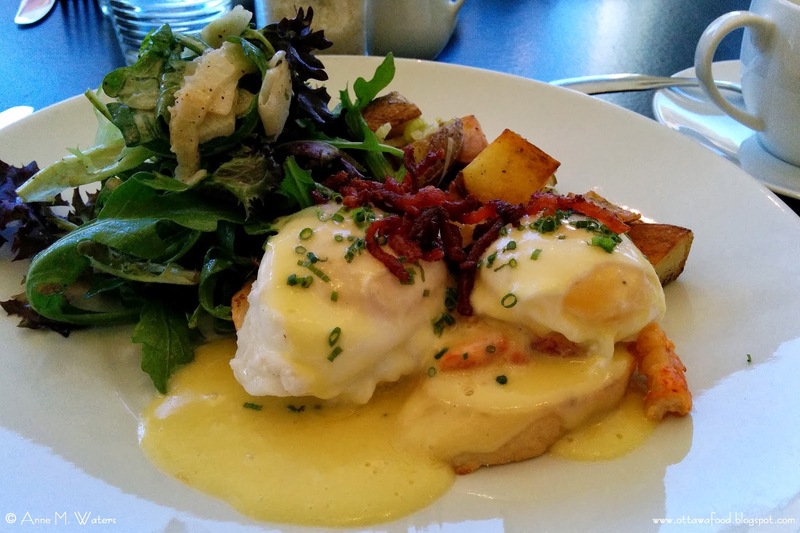 The lobster benny is not a typical brunch item in town so I decided to treat myself. A decadent thing to do for sure.